The other day we went out for breakfast and the child just about devoured an itty-bitty jelly container of lemon marmalade. I sat watching in amazement as she licked the little plastic thing clean. I mean, I know she likes lemons. It started awhile ago when we did some lemon prints and she spent more time sucking on the lemon than stamping with it. So when we arrived home I figured we should make some marmalade, but we only had a couple of those yellow things hanging about. I did, on the other hand, have a ton of mangos! I had picked some up because they were super on sale at the store thinking the wee tot was going to LOVE them – and she didn’t. 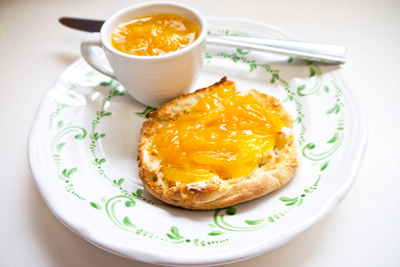 Why not combine the lemon with the mango for our own marmalade combination? When I went searching for marmalade recipes, I came across stuff with lots of steps. I really didn’t feel like putting that much effort into it – I just wanted to use those mangos and also make something the wee tot would like. So, I created my own combination and cooking method that worked out just fine for me, and passed the food tyrant test! 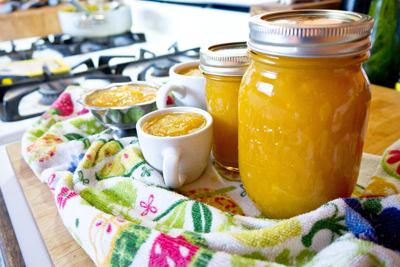 This mango lemon marmalade hasn’t touched the floor! I made the process super simple by slicing the lemons thin, removing any seeds, and then cutting them into triangles. Then I cut up the mangos and added them to the pot, too. Once everyone’s in the pot, I added the rest of the ingredients and then started the pot-a-simmering. I’m not so big on sweet stuff in the morning, so I used less sugar than some might suggest. But, the mango adds a nice sweetness, and the lemon offers that perfect tang and bitterness to the party. Now, some might tell you to boil until things get to 220 degrees Fahrenheit, but, if you don’t have a candy thermometer, you won’t know when you’ve gotten there. So, here’s the deal, simmer the stuff for about an hour, giving the mixture a stir every once in a while. After about an hour, take a closer look at your pot. The mangos will have broken up and the lemons should be transparent and falling apart, too. I got out my potato masher and helped break up some of the big chunks hanging about. I let my marmalade simmer for another 20-minutes or so because I wanted it to be really thick, but you can take it off the heat whenever you are ready. Now carefully ladle the stuff into sealable jars and cap. Let them come to room temperature before keeping in the fridge. These are safe to keep in the fridge for 4-5 months or so, but you’ll probably eat it all before then! I ran out of jars while making this batch, so put some in small cups and containers, perfect for a morning serving on an english muffin! OMG, this looks SO good! : ) We’re all big fans of lemon curd, mangos … and orange marmalade (Paddington Bear instigated the first purchase of a jar for the Chicklets, and we’ve all been in love ever since!). I cannot wait to try this delicious-looking recipe — it has something for everyone! OMG is right !! This was so delicious. I had bought fresh mangoes even though they are not in season here so the flavor wasn’t as great as it could of been. This time I bought the frozen mangoes and am going to try another batch, perhaps the mango flavor will be more intense. But that first batch went lickity split it was that good. The mix of tangy and sweet is a perfect blend. Just a note though, to cut the mangoes smaller chopped because I found there were string filaments from the mangoes when eating. This is an excellent recipe to be enjoyed and thanks for sharing Sarah.